A reaction in which one functional group in a molecule is replaced by another functional group. A reaction in which one functional group in a molecule is replaced by another functional group. When a mixture of methane and chlorine is exposed to ultraviolet light, a substitution reaction occurs. 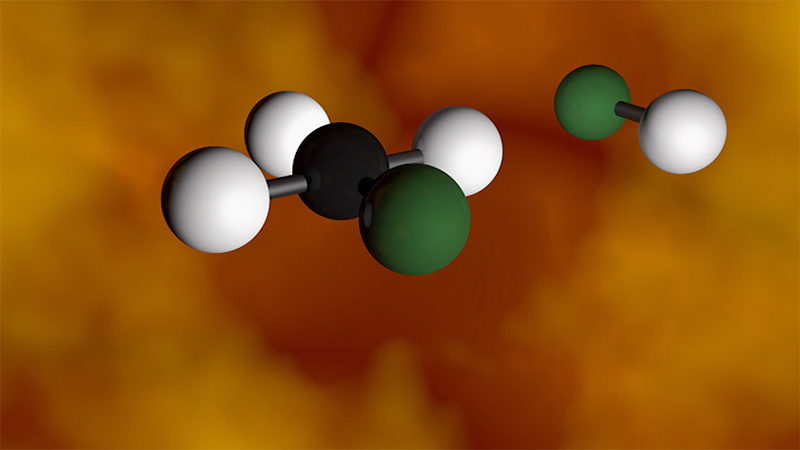 A hydrogen atom is replaced – or substituted – by a chlorine atom, forming a new substance called chloromethane. If another hydrogen atom is replaced by chlorine, in a further substitution reaction, it forms dichloromethane. Dichloromethane is a chemical used to remove caffeine from green coffee beans, to produce decaffeinated coffee. When a mixture of methane and chlorine is exposed to ultraviolet light, a substitution reaction occurs. A hydrogen atom is replaced – or substituted – by a chlorine atom, forming a new substance called chloromethane. If another hydrogen atom is replaced by chlorine, in a further substitution reaction, it forms dichloromethane. Dichloromethane is a chemical used to remove caffeine from green coffee beans, to produce decaffeinated coffee.